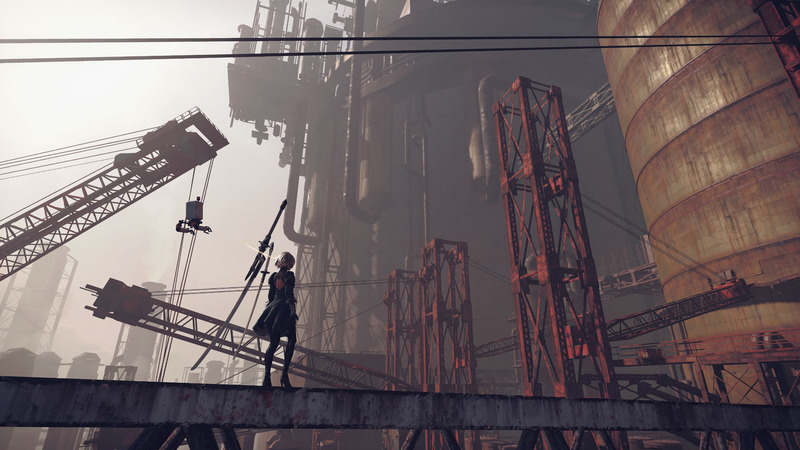 To attempt to understand NieR Automata, and the game it is sort-of a sequel to, 2010’s NieR, is to attempt to understand the mind of Taro Yoko, game director and oddball extraordinaire. One of the lesser known members of the series of Japanese auteurs who emerged at the turn of the millennium (see also Goichi Suda, Hidetaka Suehiro et al), Yoko is famous for both his personal quirkiness (he almost always wears a full face mask in public appearances), and his dark, heavily philosophical, and often nihilistic style. The original NieR was his signature work, a twisted futuristic epic which dealt with identity, spirituality, morality, and humanity, but which was also famously something of a nightmare to actually play. It attained cult classic status but even its most ardent defenders would admit it was far from a perfect game, and often some distance away from even a good one. This unexpected pseudo-sequel – none of the original characters return and the story is almost entirely disconnected – finds Yoko teaming up with PlatinumGames, master purveyors of character action insanity, in an attempt to remedy the mechanical issues of the previous title. It’s theoretically a match made in heaven, but can two such disparate styles successfully come together? At heart, Auomata does not stray too far from Platinum’s preferred and time tested formula. It’s a third person character action game with a variety of melee weapons and the studio’s favoured ‘dodge on the right trigger’ mechanic. Structurally however it’s a radical departure from previous works such as Bayonetta and Metal Gear Rising, instead taking the form of a free-roaming open world with RPG elements such as levelling up, weapon upgrading, and various side quests. In addition, as with the original game, there are a large number of bullet-hell style shooting sequences, with the game often choosing to position the camera above the player and transform completely into a Geometry Wars style twin stick shooter. It’s a bizarre mash-up of genres that sort of works thanks to clever implementation and the weird variety it adds to the play. Automata‘s world is definitely not large by modern standards, and it’s also sparse and largely non-interactive. What it is though, is hauntingly beautiful.The setting immediately gives the world an emptiness and sense of abandonment that imbues it with tremendous atmosphere, and while it’s not always the most technically sharp game, magnificent art design tends to patch the holes pretty well. Special credit has to go to Keiichi Okabe and Keigo Hoashi’s incredible soundtrack, which makes heavy use of choral backing and superbly conveys the damaged, isolated nature of the world our characters find themselves in. 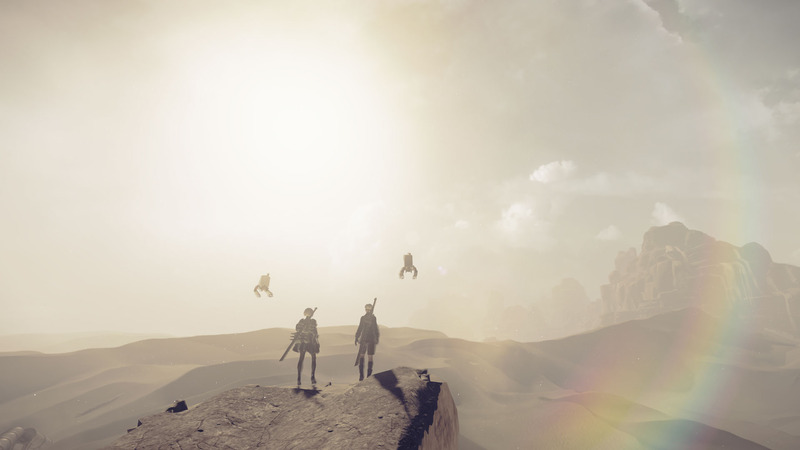 The game is set in 11945 AD (some nine thousand years after NieR), and depicts a world that has been abandoned by humanity, who have been driven away to a retreat on the far side of the moon by an alien invasion. 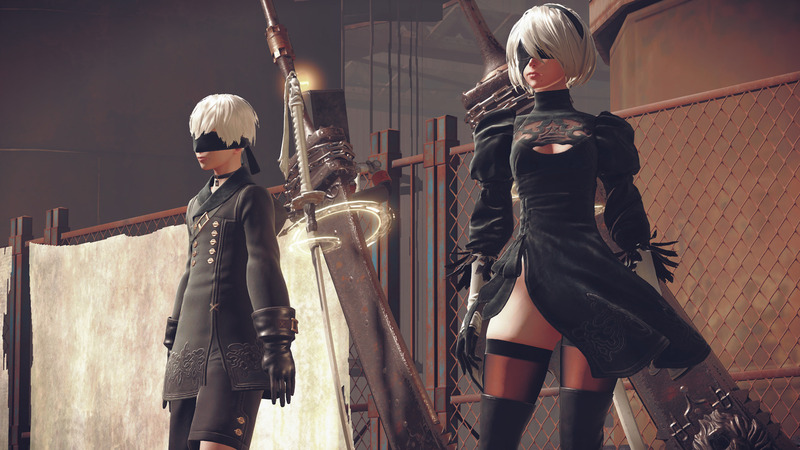 They’ve left behind an android army known as YorHa to battle the aliens and their machine soldiers, and it’s as one of these androids – 2B – that you’ll play as. 2B is accompanied by her spotter and backup unit, named 9S, and the two are deliberately designed to be a study in contrasts. 2B is designed as an adult woman, and is stoic and unfeeling, brusque and sparing with her words. 9S looks more like an adolescent boy and is more openly affectionate, cracking the occasional bad joke and is much more questioning and curious of both 2B and the world around him. From these simple starting points Yoko expands his story to cover an incredible number of bases, as the game dives deep to explore war, religion, ethics, politics, and any number of heady themes. 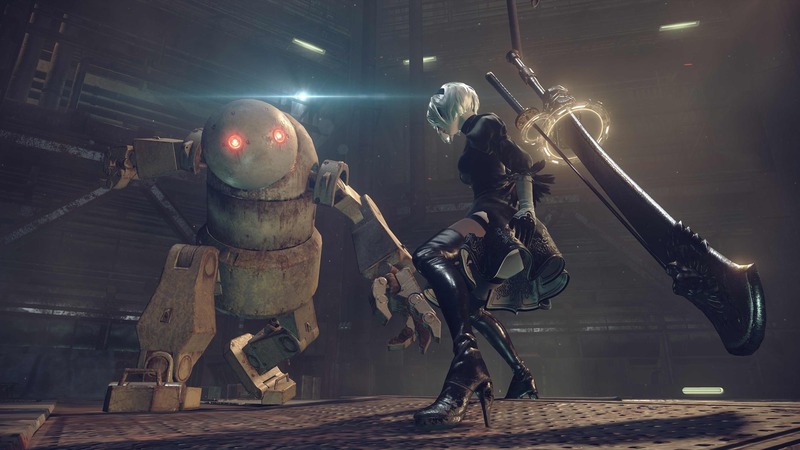 If there’s one thing which marks out the game as a sequel to NieR it’s their shared connection with exploring the concept of the human condition. The fact that the protagonists are in fact androids, and their enemies machines, only gives the script even greater flexibility in exploring the ideas of consciousness and spirituality. As you’d expect in a story about intelligent machines, the concept of transhumanism and the very nature of sentience are recurring factors, and the game creates numerous scenarios that are designed to make us question the morality of our characters and even the very mystery of their existence. It’s all very ambitious stuff for any piece of media, let alone a video game, and I’d be lying if I claimed it was 100% successful. The game can vacillate between being alarmingly blunt about what it’s trying to explain, to hiding away content in obscure documents and side quests. It doesn’t help that the vast majority of the sidequests are not much fun, with tedious fetch quests making up most of them. They’re still difficult to resist though given the intriguing facts about the world they often reveal, or the compelling miniature tales that some of them tell. Though the content is no great shakes the dialogue and presentation that surrounds them is rarely less than sparkling, which makes it all the more frustrating that the gameplay doesn’t live up to the same standard. 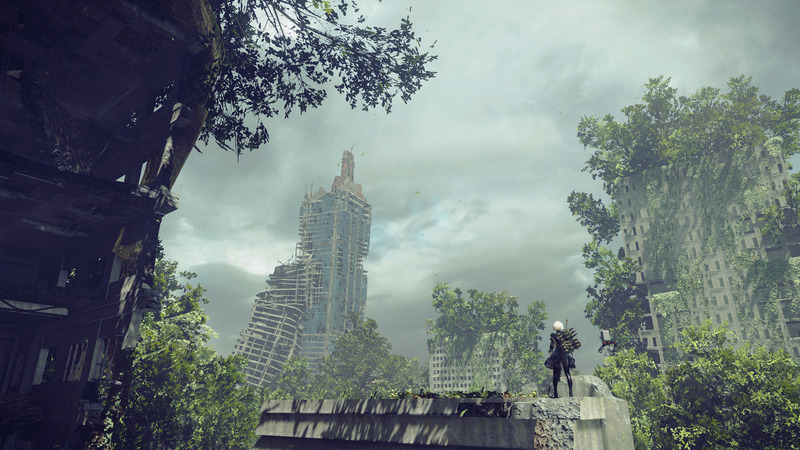 In fact, though it’s light years ahead of the original NieR the game in general doesn’t match the razor sharpness of Platinum’s best works, with the movement feeling a little slow and muddy and the combo system quite restrictive, though a wide variety of weapons does help this final point somewhat. I never felt that the game was badly designed or hostile to players in a way its predecessor often was, but it was sometimes a chore and often gets repetitive. In fact repetition is an important point here, as Yoko employs a mechanic that he’s become somewhat (in)famous for, which is gating content behind repeated plays of the game. 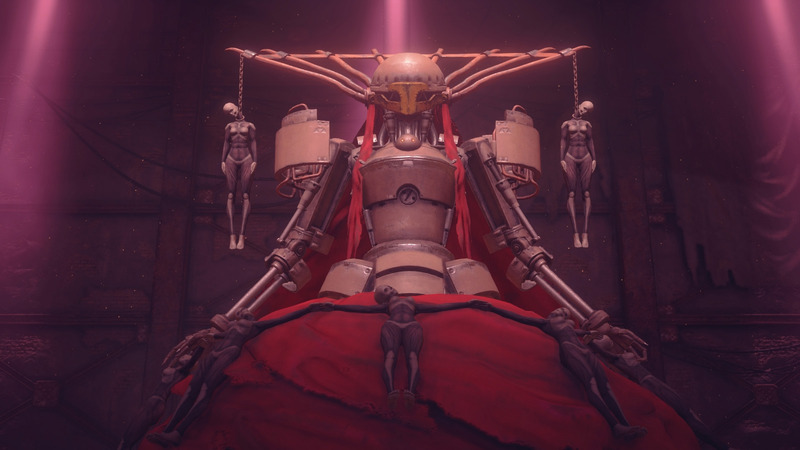 Reaching the ‘end’ of Automata means you’ve probably not seen more than a third of what the game has to offer along its critical path, and repeated plays are essential to progress the story further and reach the true conclusion. In all Automata has five ‘real’ endings and a further twenty one ‘bad’ endings (which are usually jokes, complete with ultra-fast credit scrolling). I’m deeply torn on this structure – at its best it offers startling insight on previous events by supplying additional information from a differing perspective, but it’s also often tedious to go through content you’ve already seen, and I feel that a lot of the extra content from subsequent playthroughs could have been elegantly integrated into a single ‘true’ path through the game with a bit more effort. It’s even more frustrating since the game arguably holds back an awful lot of its best stuff until you’re very deep into the replay loop. 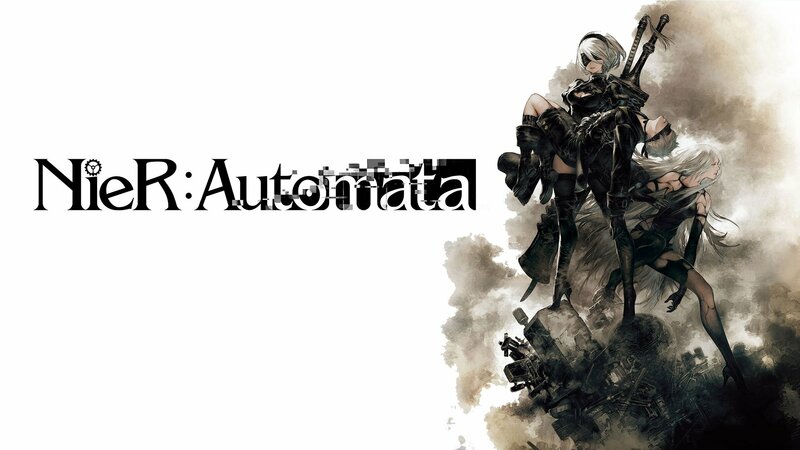 In its defence though, Automata is far more forgiving about this than previous Yoko games have been, with the majority of the content after your first replay being entirely new. Overall then NieR Automata remains a game of fascinating contradictions. Platinum’s presence has certainly improved the playability of the game, but only to the point where it’s no longer actively painful. I’d still say that mechanically Automata is a clunky game, with obvious problems in pacing and structure and a lack of adequate quest design. But the things it does well are so important and so profound that it’s relatively easy to overlook nagging issues with the gameplay. It’s a game which challenges perceptions and personal philosophies, and makes you empathise with both the characters onscreen and the broken world they find themselves unavoidably fighting over. And it’s a game which proves that the imagination and innovation which once propelled Japan to the top of the videogame world is still alive and kicking. Like the machines it follows, if it falls short of perfection that only serves to make it more endearingly human.